The difference between finding a wedding photographer and your other wedding vendors is that your photographs will last forever. Once your big day is over, if something went wrong it will either become a memory that you choose to laugh about over time or you might even let it slip from your memories all together. But with your photographs, that is something that you will not be able to drop so easily because you will have to live with them for the rest of your life. You certainly don't want a situation where you never want to pull them out after your first time of viewing them. And it would be awful to have the constant feeling that you would like to rip them up. So what that means for you is that you need to take your search for a professional wedding photographer very seriously. 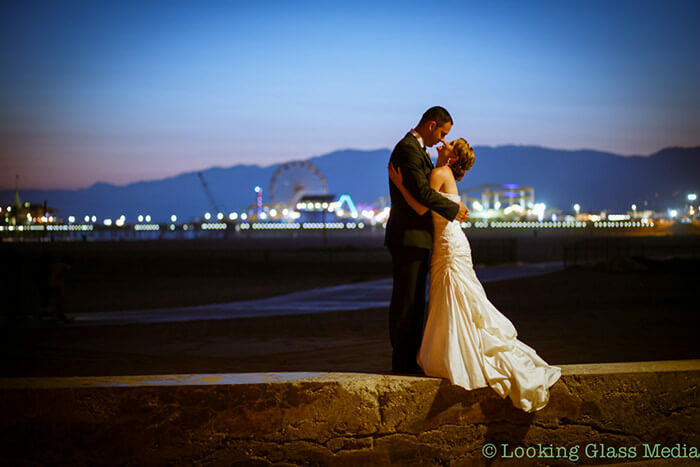 Searching in the Los Angeles area, there will be no problem finding a quality wedding photographer, but the key words are finding one. Part of your search will involved intense research and part of it must include a discerning eye as you determine which photographer would be a perfect fit for you. We hope the guide below will help you in your search. The first thing that we recommend you do is to educate yourself on different photographic styles. You need to figure out which style you want for your wedding. The first style to think about is documentary. This goes against the grain of what most people are used to in terms of taking pictures. Most of us are used to posed photos. A documentary style calls for spontaneous shots or actions shots if you will. People on the dance floor cutting a rug or your guests arriving and walking to their seats or shots of the champagne toast. This is capturing your event as it happens. Another style to consider is more traditional where people stand and pose. You will have different group shots of you and your fiancé, all of the bridal party, family shots, and more. A lot of times these shots are taken in front of backdrops that the photographer either brings himself or a setting that seems appropriate for classic portraiture. Yet another style possibility is called fine art. This style takes the documentary genre to a different level because it allows the photographer to choose the reality they feel would be best. In this style, the photographer attempts to be edgy and dramatic. An offshoot of this style is called edgy-bold. This style is for the person who is very creative and doesn't mind their photographs having a creative angle. In this genre, you will find tilted angles and unconventional framing. You will also find some foreground/background approach that includes some blurring. Decide which style you like the best and be sure to focus on photographers who specialize in that style. Start you search online. It is very important to read reviews of a photographer's work at past weddings. For the ones that you find where people are consistently raving about the photographs and the experience they had, start making a list of these potential photographers. Look up the websites of each individual and check out their portfolio. Also, make sure you notice the overall website, is it professional and does it exude a confidence that this is someone who you might like to work with and who does quality work. See if their website mentions anything about their style. When you are viewing the images from their portfolio, ask yourself if you like the perspective of the shots. Once you have a short list of candidates, call up the ones on your list and ask if they have your wedding date available on their calendar. If they do, set up a time in which you can interview them. Ask them to bring more of their work to the meeting. Ask to see an entire wedding shoot, not just a finished album. Talk about their experience and how many weddings they have done. Another very important issue is to weigh how much you like them personally. You want to enjoy your special day, not be dealing with someone who grinds you. Lastly, you will want to ask what various packages they offer. Look for one that fits what you want. When you find a candidate that you mesh with and whose services fall in your budget range, ask to see a written contract which spells out everything. You can now rest easy knowing that you have done all you can do to make sure you have the perfect wedding photographer for your special day.